New York is the Largest of these skyline models: it contains a number of structures that have featured previously in Lego: The state of liberty- possibly its smallest possible LEGO manifestation, as a sand green ‘trophy nano figure.’; The Empire State Building – larger and greater detail than seen in Architecture set 21002; the Flatiron building (previously released as 21023) and LEGO debutantes: the Chrysler building in its art deco, pearl metal glory and the new World Trade Centre. At $AU70 for 598 pieces, this represents around 11 Australian cents/ piece. The microscale buildings are laid out along a 4 x 32 base constructed out of black plates. The urban pavement (in New York, it will always be pavement rather than footpath…) is modelled in light bley tiles. Transparent clear tiles form the water of New York Harbour, and olive green tiles form the grass of Liberty Island. Tan studs and tiles form the plinth with the Statue of Liberty, standing proudly on top . The model of the Empire State Building depicted here features a huge amount of SNOT (Studs not on top) work, with the external surface covered, front and back, by tan 1×2 grille pieces. The relationship of five plates to two studs can clearly be seen as you work your way up the side of the building. If you look closely, you can see the 5 plates:2 studs relationship at work here. world’s tallest brick built building, is formed through alternate layers of white and transparent clear plates and offset plates. The distinctive mitred cap at the top of the building is represented here by pearl silver ‘tooth and plate’ pieces. block between 5th Avenue, Broadway and East 22nd St. It is depicted here by a series of wedge plates, the gaps to accommodate studs giving the appearance of the windows on each floor. Simple. Nice. s urface LEGO elements, but I feel they have a achieved a good compromise here. stud.There are 3 large layers, as the building tapers: each demonstrates a different SNOT technique in its construction. I purchased this set for 12,200 Qantas Frequent Flyer Points, at store.qantas.com. It is an interesting build, with plenty of SNOT techniques demonstrated. This is a set for construction, and display. I quite like it, and the build was the most satisfying of the three. At $AU49.99 or 10,100 Qantas Frequent flyer points, with 289 pieces, the average price per piece is 17cents. Berlin is a significantly smaller model than New York. Berlin is a city that has been associated with European history for hundreds of years. This model contains a mixture of buildings dating back to 19th century: The Brandenburg Gate, the Reichstag, and the Berlin Victory Column, as well as more contemporary structures including the Fernsehturm (Berlin TV Tower – 1969), fragments of the Berlin Wall and the Deutsche Bahn Tower This skyline is constructed along 4 x 32 studs of plates, with an additional 2×4 outcrop for the bach of the Reichstag building. builds – the use of the half dome, in transparent black on the Reichstag is particularly effective. Moving on to the Cold War Era, the TV Tower is an demonstrates some interesting techniques to form the tower – technic links connected by pins; and then central rods, with round pieces passing over them. The remaining fragments of the Berlin Wall, are represented by three 2×1 panels, with printing to represent graffiti remaining on the wall. The most modern building, the DB Tower, is a much more contemporary structure, with black arches constructed around a SNOT background – again the ration of one block and 2 plates = the same distance as 2 studs is demonstrated as the tower is constructed. This was a relatively quick and easy build, taking about half the time as New York to put together. 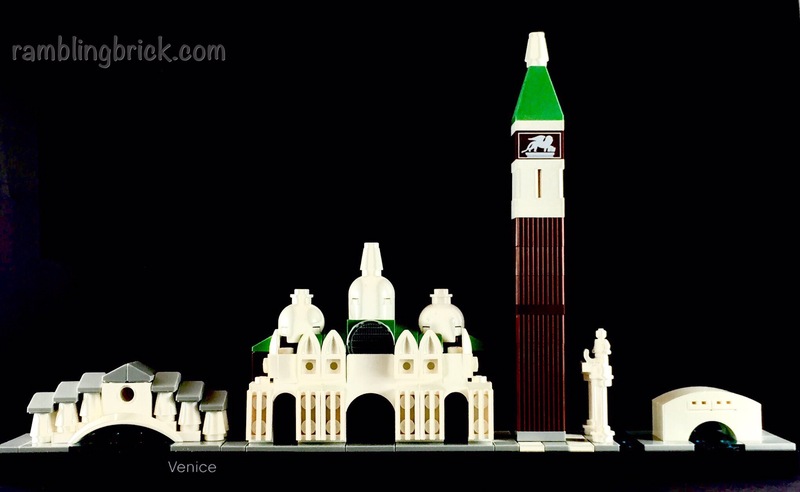 The third city to be released in this first wave of LEGO Architecture City Skylines is Venice. Build on a lagoon, with hundreds of island, Venice is a city without motor traffic, unless you count the boats in the canals. Such urban construction has resulted in a number of bridges, crossing the canals. Some of these bridges were considered significant enough to include in this set, although the builds are simple and straight forward. We have the Rialto Bridge, and the Bridge of Sighs represented. Also present is St Mark’s Basilica: this is a more satisfying build, with a few SNOT Techniques, and the use of ‘backwards teeth plates’ to represent arched windows is particularly interesting. As is often the case with microscale building, it is the gaps in the models that contribute as much to the form of the model as the pics themselves. Attached to the Basilica is the tower of St Mark’s Campanile – the bell tower. Also included is the statue of St Theodore and the Winged Lion of St Mark. 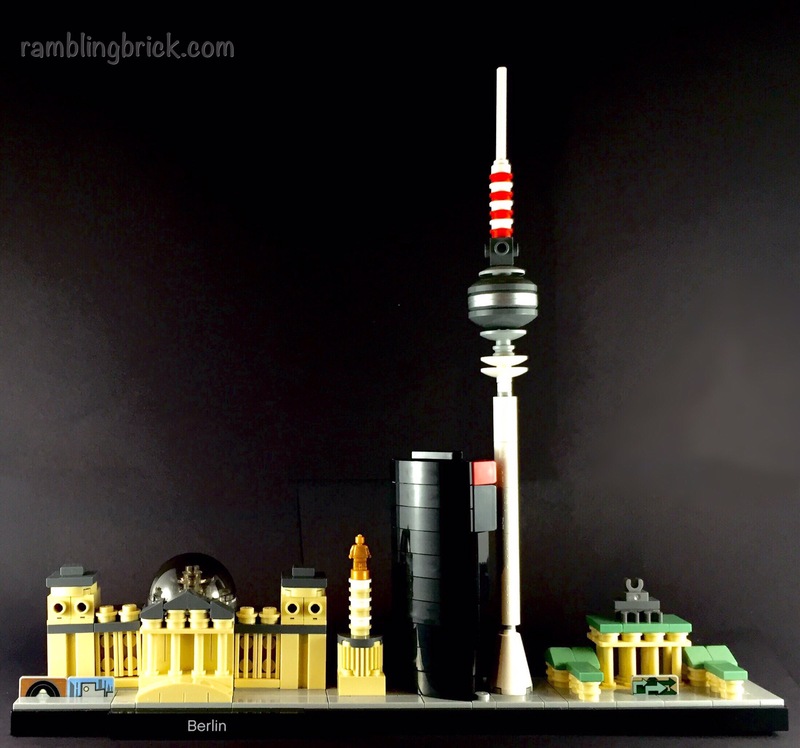 This is the smallest of the Skyline sets: not 212 pieces, but like Berlin, also has an RRP $AU49.99. One of the interesting aspects of this series, if that they all use the miniature trophy piece that first debuted in the collectable minifigure range. This piece makes a fantastic ‘micro scale statue. 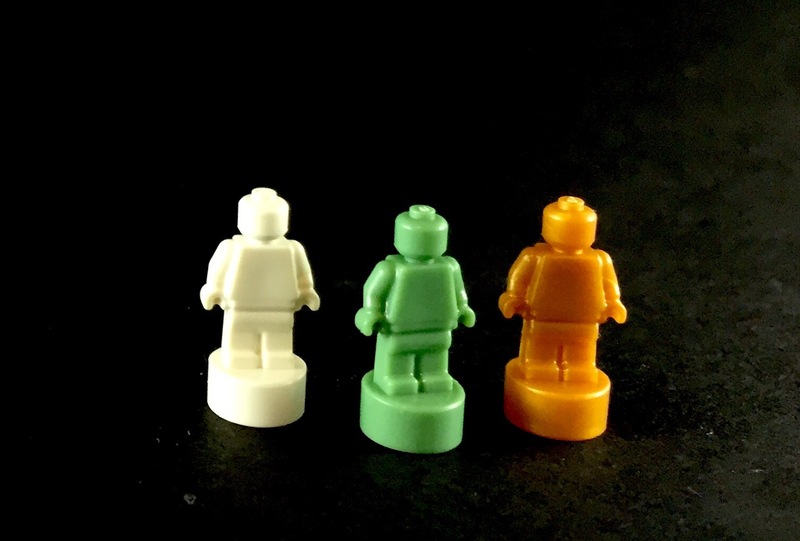 They are featured in sand green (New York), white (Venice) and gold (Berlin). Without a doubt, New York is the most satisfying build, both for mixture of techniques, as well as the ingenuity of some of the builds. Berlin again has some interesting techniques, especially in the TV tower, but the Berlin Wall fragments seem a little underwhelming to me. Venice is a relatively simple build, with little challenge involved, to the extent that there are disambiguation diagrams on every step that features a brick where confusion has the opportunity to be achieved. Whilst New York was an interesting and engaging build, the same could not be said for the other two. But there is more to the LEGO Architecture series than aiming for an enjoyable building experience. They often act as display pieces: momentos of travels taken, people met and places seen, or to be seen! In this latter role, these sets meet the brief. The instruction manuals give you a little of the history of each city as you build them up, providing little tidbits of information, that often tease you towards wanting to know more: to stretch your imagination, and perhaps inspire you to look towards the defining aspects of a city, and create your own version. There are a number of cities with distinctive architecture, spanning centuries, that could be candidates for this treatment. London and Paris are perhaps the two most obvious that spring to mind. The NYC set I consider to be worth a solid 3 1/2 Abitrary Praise Units, while I consider Berlin and Venice to both earn 3 out of 5 APUs. They are all relatively expensive, compared to city or creator sets, but look great on the shelf. And sometimes, they might just blow you away with the construction techniques.